Analog Man carries the Electro-Harmonix US12AC-1000 Power Adapter. 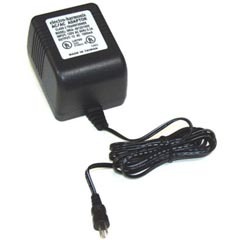 Power adapter for the Electro-Harmonix Hot Tubes, black finger, English Muff'n, LPB 2ube, Tube EQ, Tube Zipper, and The Wiggler guitar effects pedals. Funky looking plug ("T"-shaped) USA adaptor. Odd shaped plug, a dot and a dash. 12Volts AC 1000mA (1 amp) for Electro-Harmonix tube pedals. Hot Tubes, Tube Zipper, Wiggler, Black Finger, LPB2ube, Tube EQ, English Muff'n, 12ay7 Mic Preamp, Tube EQ, pretty much all the EH Tube pedals.